There was a nice mixture of new players as well as experienced tournament veterans that participated in this month's K-8 Scholastic championships. 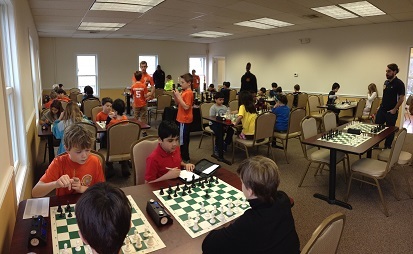 In the K-8 section, the very experienced Dmitri Efimov won all four games to win first place! Dream Teamer Daryl Lavin finished in second with 3/4. 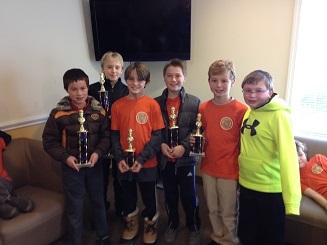 Ryan Johnson, Jake Fine and Ross Edkins all played in their first chess tournament ever! 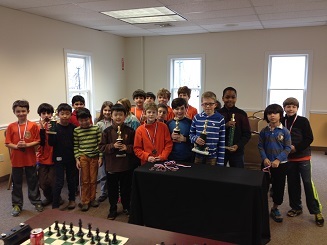 The eventual winner of the super competitive K-5 section was Samuel Forfang who made his return to tournament chess after going several months without practice. There were many brave first timers in this section as well. Among them were Augustus Cai, Owen English, Jack Haythorn, Dylan Delaney, Tyler Moody, Jonah Wald, Varun Prabhu and Natalie Johnson. 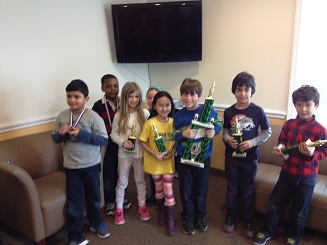 The K-2 section was won by Dream Teamer Louis Savarese with the third perfect score of the day! Close behind was Max Ingargiola. Max finished in second place despite it being his very first tournament! Amol Shukla and Joseph Marous were also competing for the first time. In-between the rounds, the players would rush off to have their games looked at by CCFC Instructor National Master Arslan Otchiyev, who was on hand throughout the tournament providing complimentary instruction. Thank you to everyone who participated for making this a fun and memorable event!